Civil liberties and peace advocates are rallying to support federal district Judge Anna Diggs Taylor, who is under vicious right-wing attack for her landmark Aug. 17 ruling that the Bush administration’s program of wiretapping without warrants is unconstitutional. Fox News’ Bill O’Reilly questioned whether she wanted “Americans to die,” implying she was aiding terrorists. The right-wing Judicial Watch claimed that Taylor had a conflict of interest in ruling in the case, American Civil Liberties Union v. National Security Agency, because she served on the board of a community foundation that made modest contributions to the ACLU, among other organizations — a kind of service that judges often do without being challenged. Appointed to the federal bench by President Carter in 1978, she is the first African American woman judge ever named to the Eastern Michigan district, which includes Detroit. Ed Yohnka, a spokesman for the Illinois ACLU, told the World, “It’s unfortunate that this attack on the judge obscures and seeks to blur the importance of her ruling. 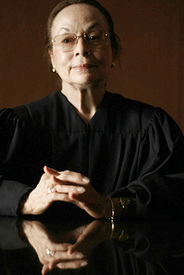 Her decision is in line with other recent rulings, such as Justice Sandra Day O’Connor’s decision in the Hamdi case and the Supreme Court’s recent ruling in the Hamdan case.” He was referring to two major rulings that upheld civil liberties of people held in detention for as long as two years without any of the rights guaranteed by the Geneva Conventions. Yohnka warned against congressional attempts to “overwrite the judge’s decision” during the short House and Senate session this month. Fishman warned that if Taylor’s ruling is overturned on appeal, “we are in for very serious problems in the next two years of the Bush administration. The only thing that would change that is a change in the House of Representatives” in the Nov. 7 election. Taylor ruled that the NSA spying violates the First and Fourth Amendment as well as the Foreign Intelligence Surveillance Act of 1978. Bush also violated the principle of “separation of powers” embodied in the Constitution, she charged, since he ordered the spying without approval or knowledge of either Congress or the courts. “It was never the intent of the Framers (of the Constitution) to give the President such unfettered control particularly where his actions blatantly disregard the parameters enumerated in the Bill of Rights,” she wrote. Last spring, Bush denied his administration is “trolling through the lives of millions” of innocent people. Even as he spoke, USA Today reported that the three largest phone companies, at the administration’s request, were funneling tens of millions of phone calls and e-mails to the NSA to develop an enormous database on every phone call made in the country. A Washington Post article said the volume of information was so huge it impeded the search for real terrorists.